Well, the year 2558 is coming to a close. No, we haven't time-traveled to the future, although the blog is so far behind, it might as well be a history book. 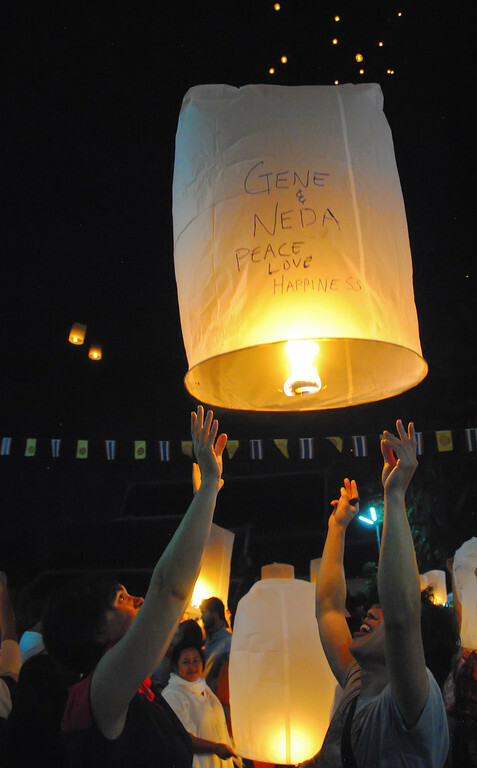 As we've noticed in all the dates we see on the newspapers and flyers around town, the Thai calendar is measured in the Buddhist Era, which is 543 years ahead of the Christian Era of the Gregorian calendar. 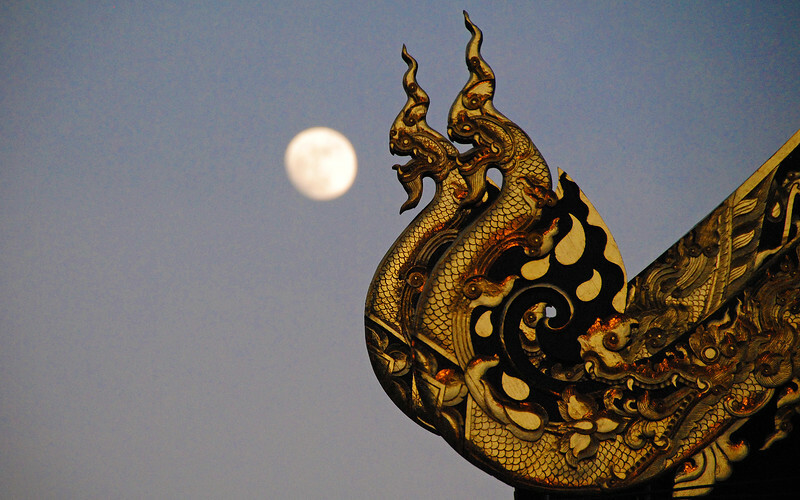 In the Buddha Era Calendar, the most important days are the full moon days. 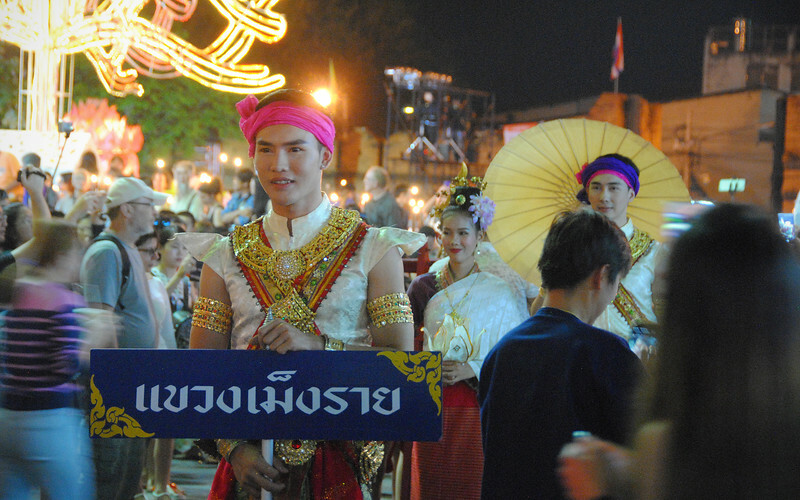 That's when all the Thais and tourists come out to celebrate. 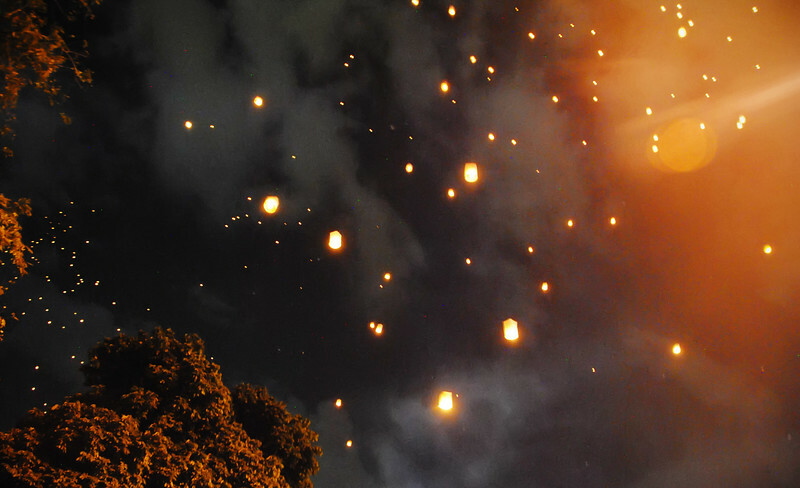 And of all the Full Moon celebrations, the most visually spectacular is the one celebrated on the 12th month of the lunar calendar, Loi Krathong - the festival of lights. Normally in the western world, this means werewolves. In Thailand, it means PAAAAARRRRTTTTEEEEEE!!!! 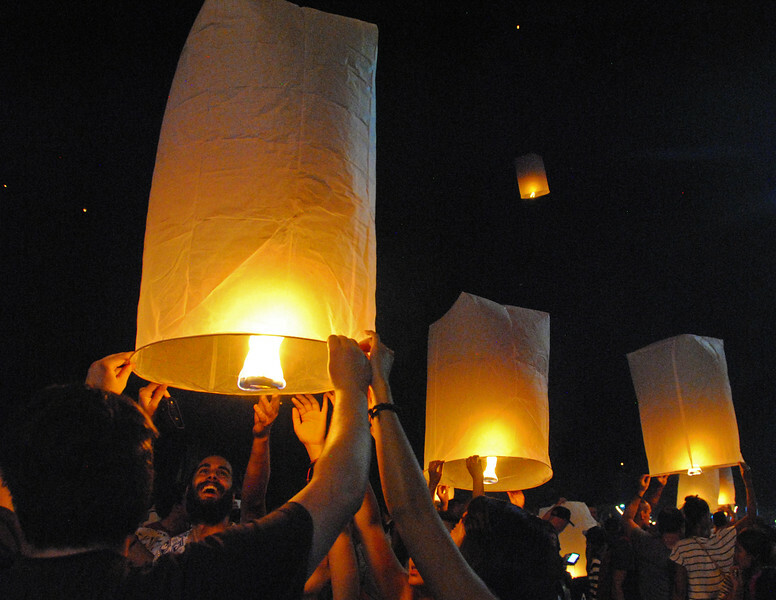 Loi Krathong celebrations in Chiang Mai take place over several days. 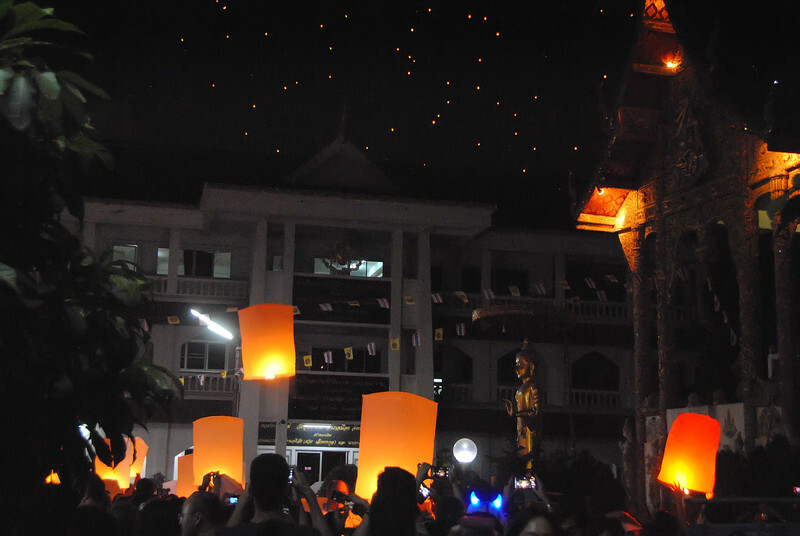 We heard the monks at the Wat Phan Tao, right in downtown Chiang Mai, were throwing a huge party the day before the full moon, so we dropped in. 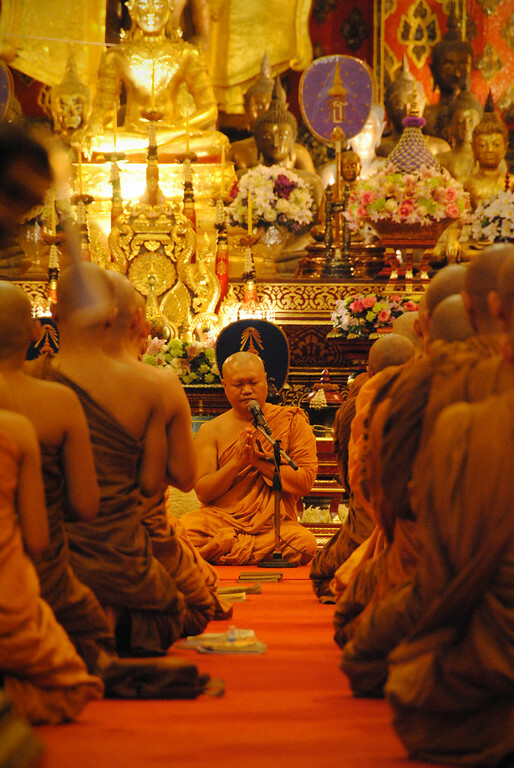 This is how the Buddhist monks celebrate. Wat were you expecting? It does get livelier though. 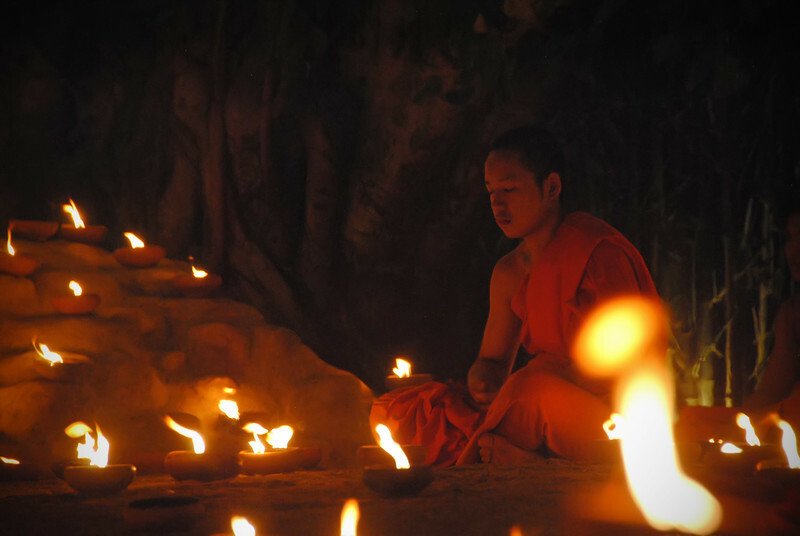 Outside the temple, the monks were carrying small ceramic bowls of wax with a candle inside. They were placing them all over the temple and the grounds. 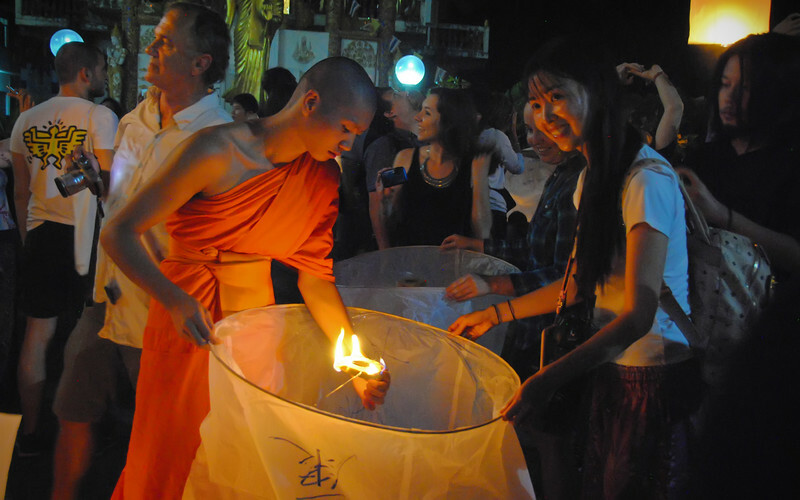 You can donate some money to the temple and receive a Buddhist votive candle. 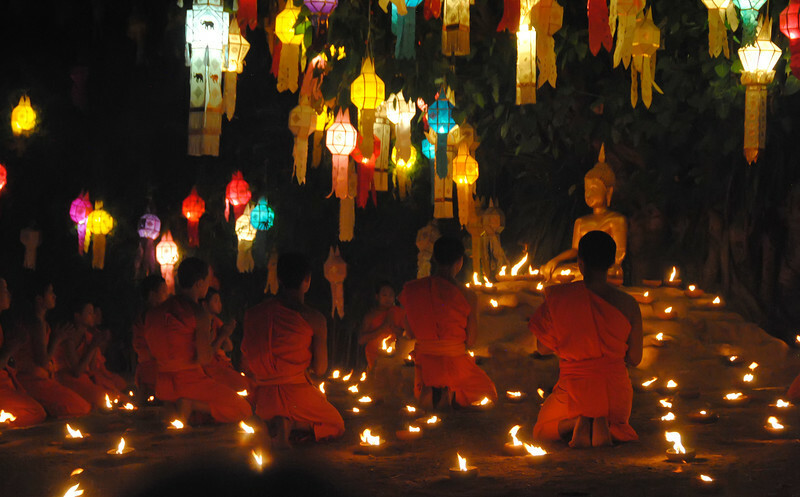 Loi Krathong is a special occasion, so at Wat Phan Tao they organize an outdoor ceremony where novice monks practice the light waving rite. 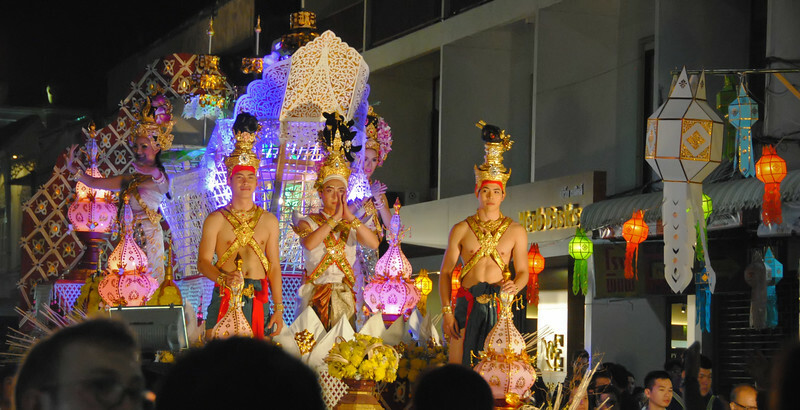 The next evening is the actual full moon ceremony, and tens of thousands of people will spill out into the streets of Chiang Mai to celebrate. Iva, the whirlwind traveler has arrived in town from her densely packed itinerary just in time to celebrate Loi Kathrong with us. 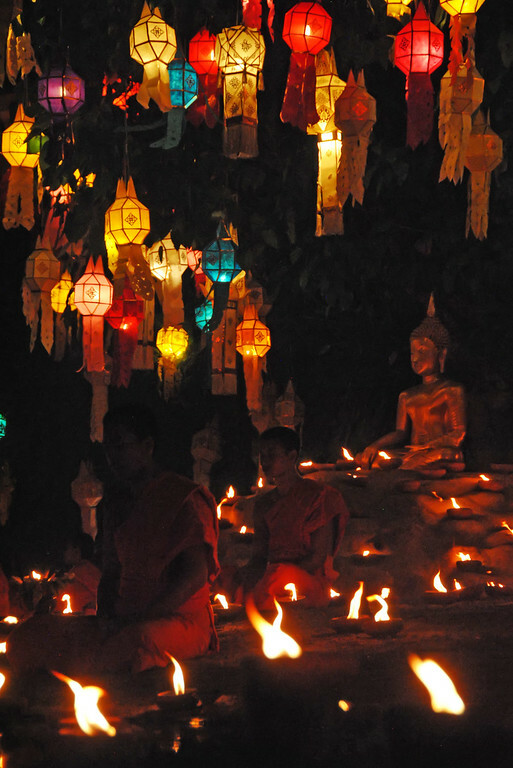 We sat down with her during the day and she regaled us with stores of where she had been in the last 10 days: the temples of Angkor Watt in Cambodia, the ruins in Ayutthaya, the beaches of Phi Phi. "So what have you guys done since I last saw you?" she asked. "Um. 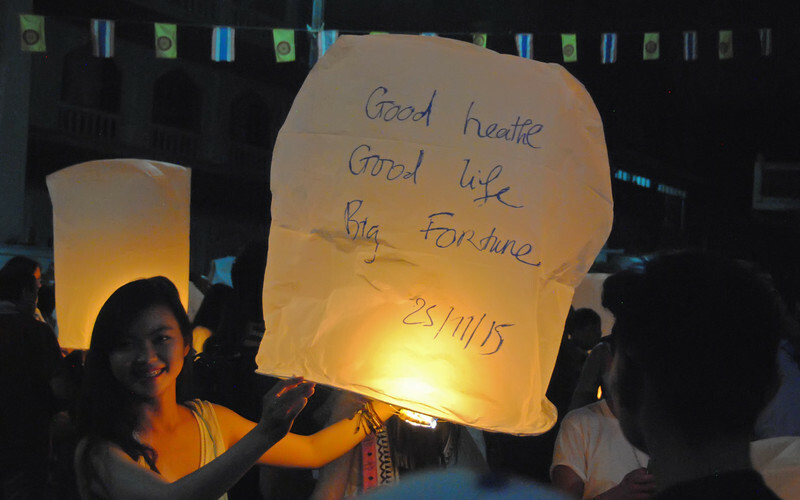 We took the train from Bangkok to Chiang Mai... Oh and we ate a lot of food. Like, A LOT of food! And... we're seeing Loi Kathrong tonight!" 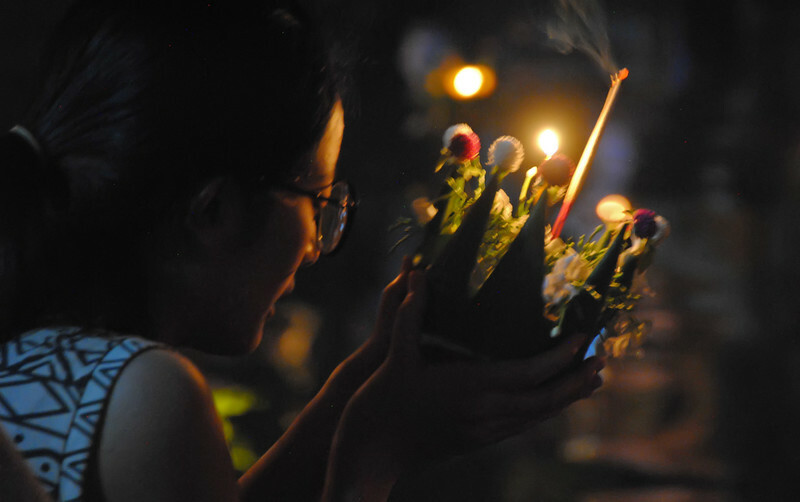 A Krathong is an offering made of banana leaf and wood shaped into a lotus flower. 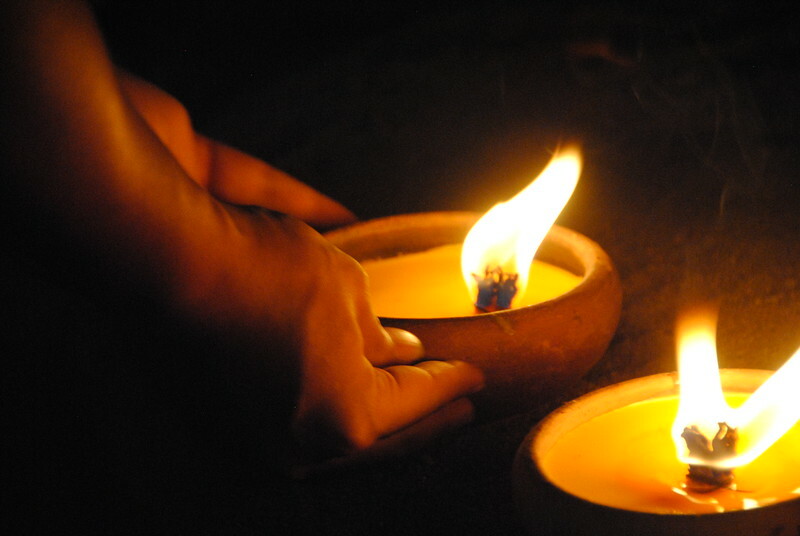 They are typically decorated with a candle, an incense stick, perhaps a coin and a lock of hair. 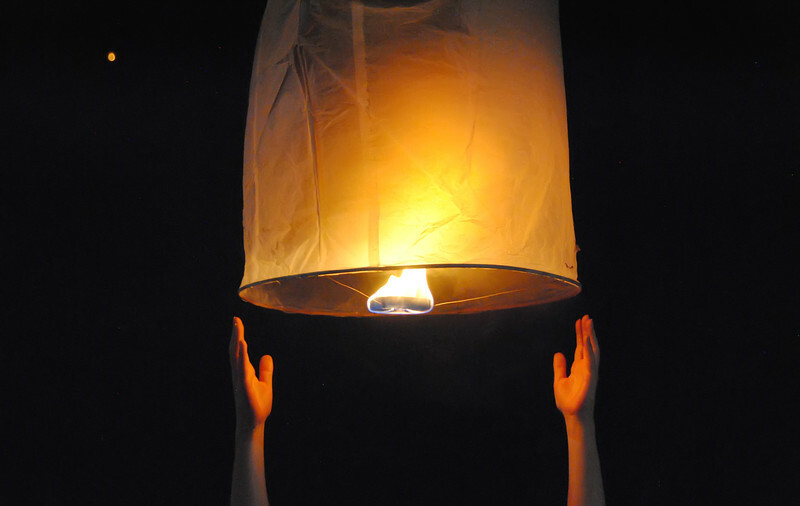 The idea is to place all of your bad fortune into the Krathong and release it into the river away from you. 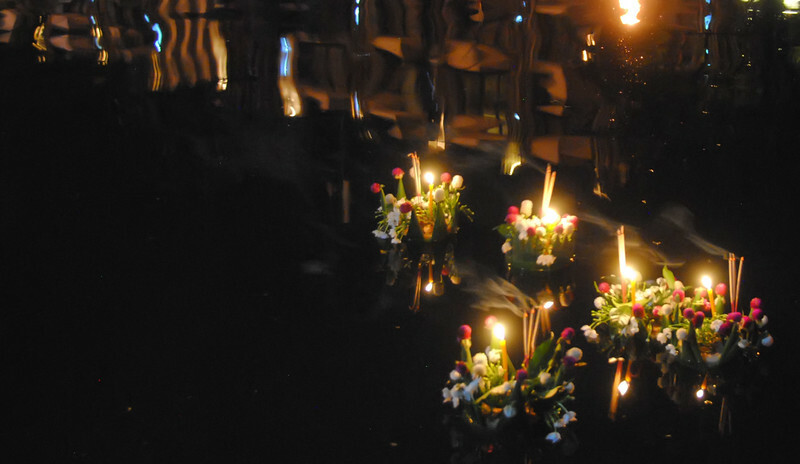 The first person to ever create a Krathong was Noppamas, the daughter of a Brahmin priest in 1850AD, she presented it to the King of the Sukhothai kingdom and he released it into the river. Then he married her. Then came the floats. It was breathtaking. 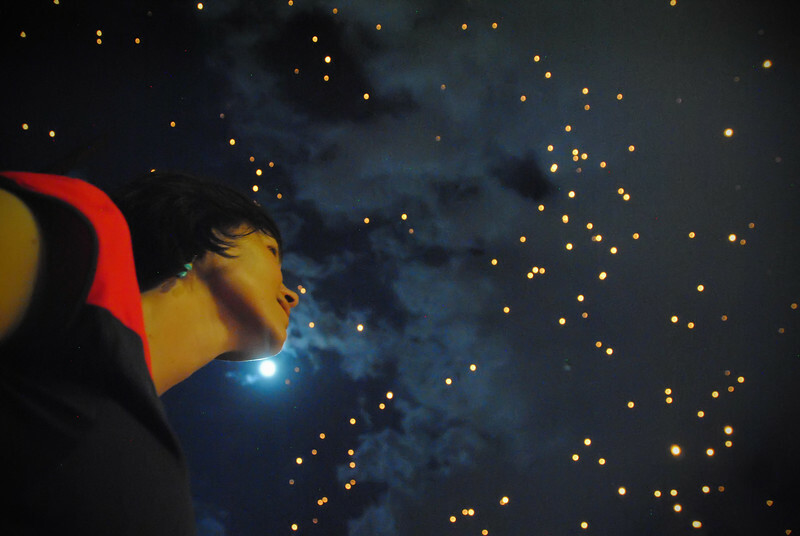 Thousands of orange lights, like fireflies rising up into the dark clouds of the night sky. 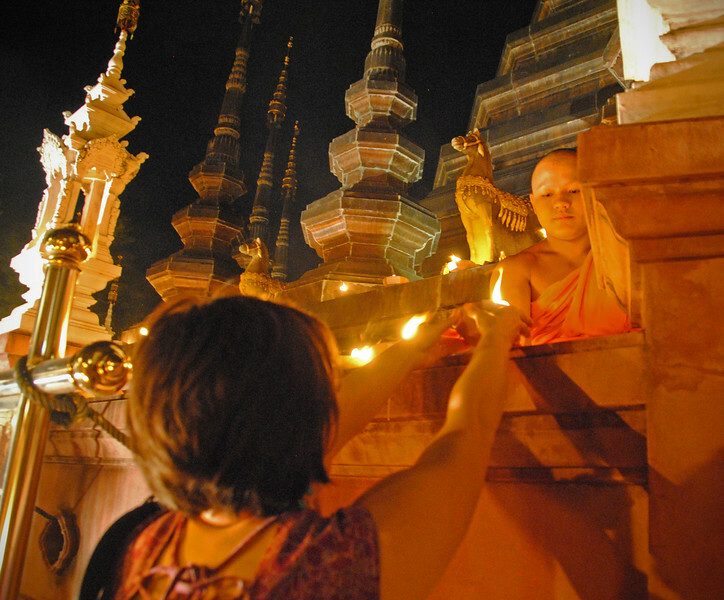 It all seemed to be coming from Wat Phan Tao temple, so we quickly headed over there to see what was going on. 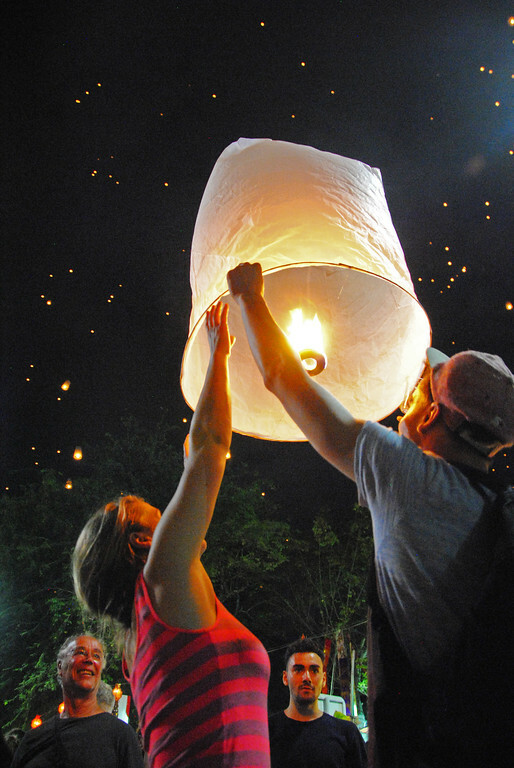 Although Loi Krathong is Thai holiday, Chiang Mai has put a special twist on this celebration. 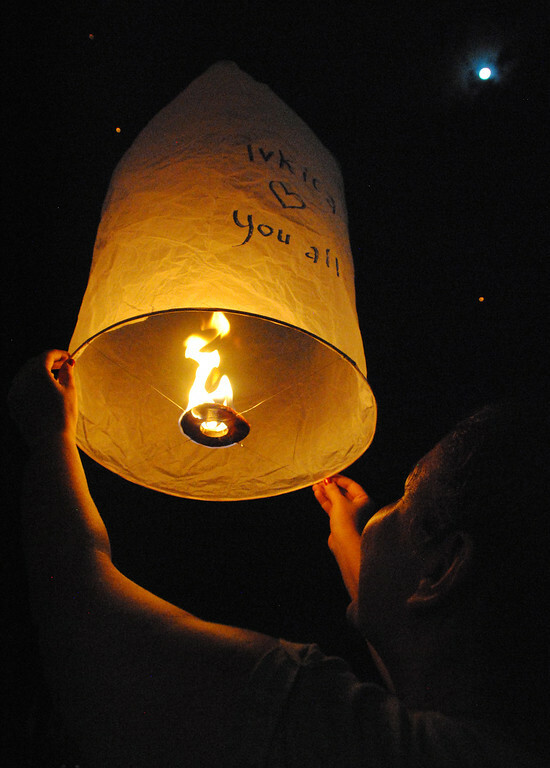 Because Loi Krathong also coincides with the Lanna (Northern people) festival called Yi Peng, this tradition also launches thousands of paper lantern balloons into the sky like embers rising from a flame. 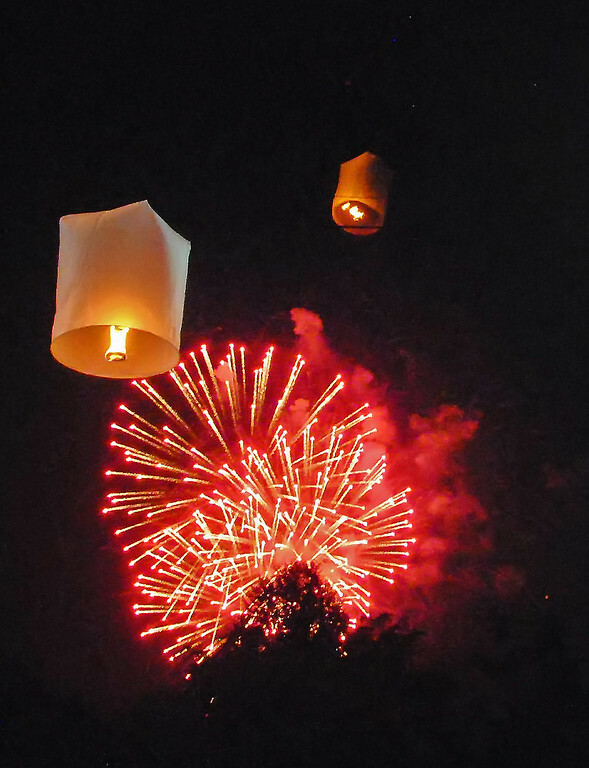 So along with the thousands of Krathongs floating down the river, you have the mirror image of the paper lanterns floating up in the sky. 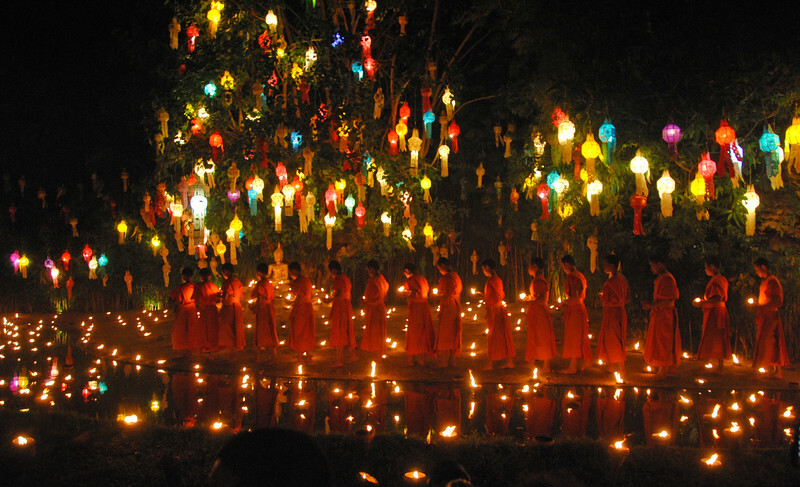 It truly is a Festival of Lights! 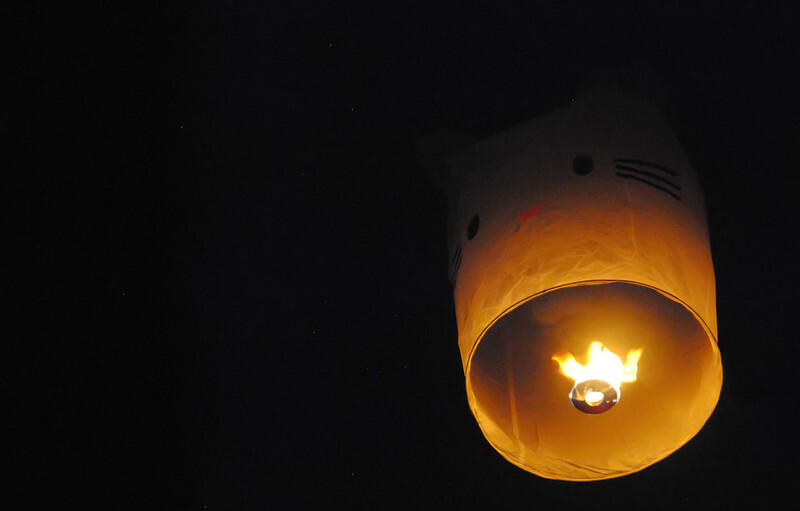 Here's a Hello Kitty Khom Loi. Not sure what the wish here is... Maybe a pink bowtie for Christmas? Looking up, it looks like something from an astronomy textbook! If you think this is not entirely safe for airplanes, you're right. 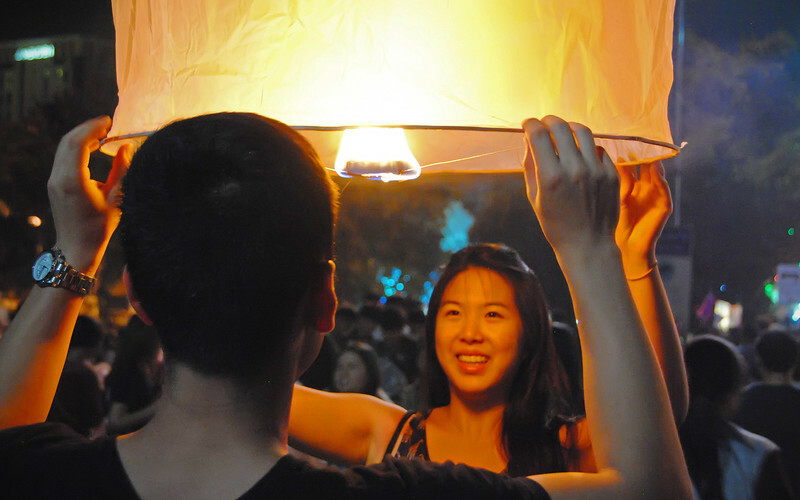 On the night of Yi Peng, you're only allowed to launch lanterns within a small window of time in the evening of the full moon. 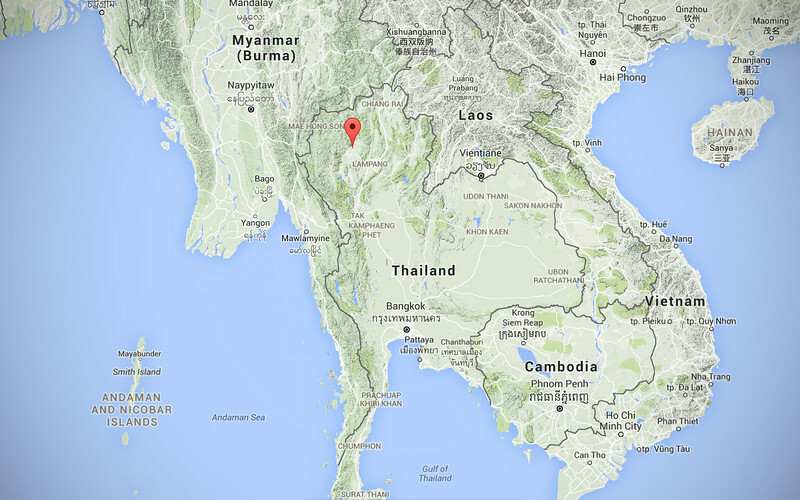 During that time, all flights are routed around the Chiang Mai area. If you launch a lantern outside of this window, you face stiff penalties up to and including the death sentence. Yes, you can actually be put to death for having too much fun. 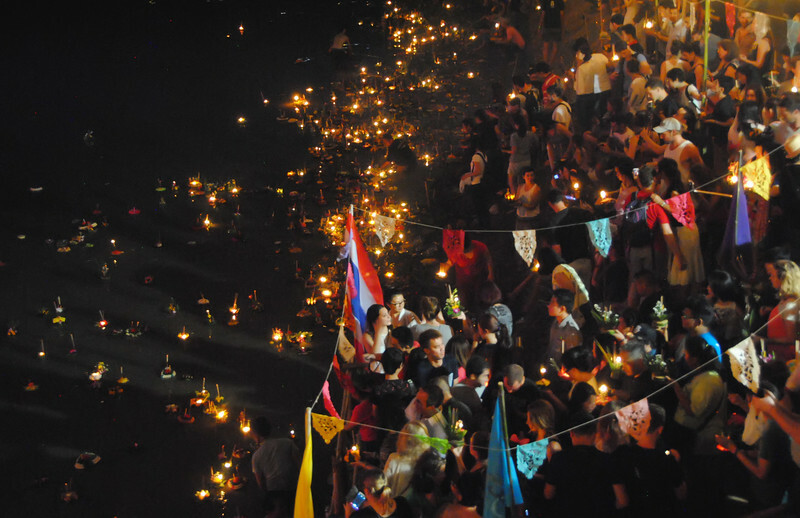 After all the tourists leave at the end of Loi Krathong, it's up to a cadre of local volunteers mostly made up of university students, to scour the dam's reservoir of Krathongs and hiking up the hills around Chiang Mai to collect the landed Khom Loi. 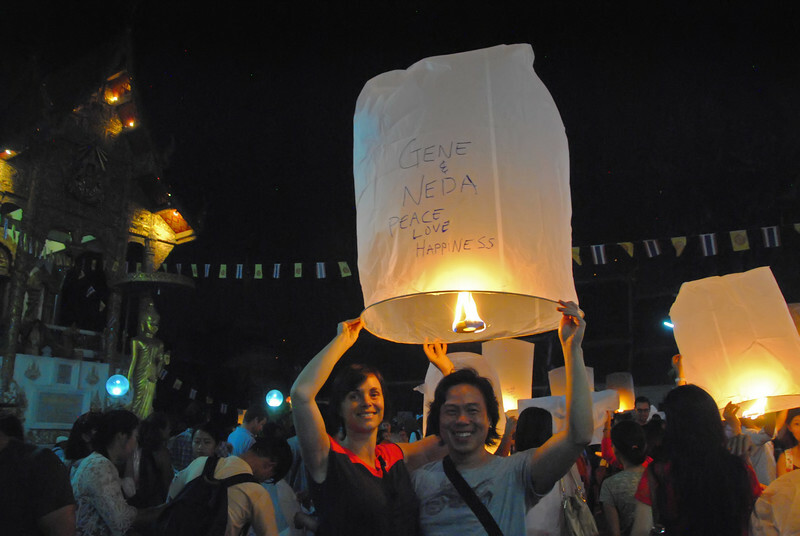 It's not a job that's much-publicized, but an essential part of the lifecycle of the festival.